"You have the right to remain silent forever.....Again!" 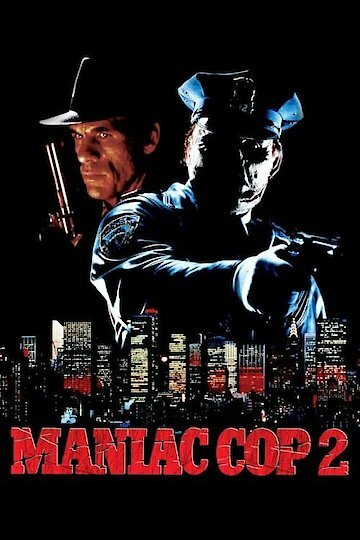 Maniac Cop 2 is a 1990 horror suspense film about an undead cop, Matt Cordell (Robert Z'dar), who continues his New York killing spree. The sequel takes up where Maniac Cop left off, with Cordell getting impaled and his van plunging into the river. Officer Jack Forrest (Bruce Campbell) and Teresa Mallory (Laurene Landon), who battled Cordell in part one, are under the care of police psychiatrist Officer Susan Riley (Claudia Christian). Although Cordell's body is never retrieved from the river, Jack believes Cordell is dead; Teresa reveals to Susan that she thinks Cordell is still alive and coming after them. Cordell finds and murders Jack at a newsstand. Teresa is distraught and terrified that she will be next. As Susan and Teresa hail a taxi, Cordell attacks the women. He breaks Teresa's neck and cuffs Susan to a vehicle and pushes it downhill. Susan now knows that Cordell is in fact alive and seeks out another cop, Lieutenant Sean McKinney (Robert Davi) to help find Cordell. In the meantime, another serial killer, Steven Turkell (Leo Rossi) forms a deadly alliance with Cordell. Through a series of flashbacks, Cordell tells the story of how he was framed and jailed by corrupt officials and mutilated in the prison shower. Commissioner Edward Doyle (Michael Lerner)is one of the officials responsible for railroading Cordell. After Turkell is arrested, Cordell breaks him out of jail and frees several inmates in the process. The duo hijack a bus headed to Sing Sing prison and take Susan as hostage. McKinney unearth's Commissioner Doyle's misdeeds and takes him along to pursue Cordell. At the prison, Doyle speaks to Cordell over the PA system and implicates himself, and promises to reopen his case. This appeases Cordell, who abandons his origial plans and attempts to leave. He first kills the inmates who attacked him in the shower and then confronts an angry Turkell who accuses Cordell of using him. The duo fight and fall several stories on top of an exploding bus. The movie ends with Susan and McKinney attending Cordell's funeral. Maniac Cop 2 is currently available to watch and stream, download, buy on demand at Amazon Prime, Amazon online.